There are currently 43 Pillar Ministries churches in India, as well as numerous smaller satellite congregations. 86 pastors and evangelists are presently ministering in over 250 villages throughout southeast India, mainly in the state of Andhra Pradesh. Pillar Missions is engaged in wide humanitarian work in association with other Christian groups in India, such as Friends of Christ International and the Christian Service Unit. Together, the humanitarian programs reach thousands of people throughout India. Some of these programs include: homes for widows and orphans, centers for leprosy victims and their families, centers for mentally handicapped children, homes for children with HIV, hospitals and clinics. In 1985, Joseph Raju became acquainted with the Pillar of Fire Church and desired to establish its work in India. The first church was established in the area of Vijayawada in southeast India by Joseph Raju and his father John. The Rajus began spreading the gospel in the surrounding area, leading to the planting of several Pillar of Fire congregations. Reverend Azariah Korabandi became involved with the Pillar of Fire work in India, and was appointed as Field Director to oversee the various congregations and ministries that have formed over the years. Under his leadership, the work of Pillar Missions has experienced much growth over the past few years, as Pillar of Fire churches, ministries and humanitarian programs continue to touch the lives of thousands of people. Make A Gift To India! Sponsorship is an incredibly powerful way to help one poor child break the bonds of poverty. Thank you for standing with Pillar Missions through your tax-deductible gift! The support of friends like you makes it possible for us to impact lives across the world with the message of hope found only in the Gospel. Comparative Area: slightly more than 1/3 the size of the U.S.
December, 2008- India is reeling from the recent terror attacks last month that killed nearly 200 and injured many more in Mumbai. The attack is being referred to as the 9/11 of India, and throughout the country there is wide-spread anger and disbelief at the nature of the attack. Despite the terrorists intent to destroy and intimidate, God is at work using the aftermath of this tragedy to show His love and reveal His truth to the Indian people. In the town of Khammam, headquarters of Pillar Missions in India, town officials organized a special memorial service, to help bring the community together during this time of uncertainty, fear and anger. Leaders from the Christian, Hindi and Muslim faiths were asked to speak at the service, to offer words of comfort and hope to the community. Pillar Missions Field Director Azariah Korabandi was asked to represent the Christian faith, and was given the opportunity to address the large crowd, along with an imam from the Muslim community and a Hindu priest. Of the three speakers, Azariah was the only one to speak to the people in their native language of Telugu. The imam spoke in Arabic, while the Hindu priest spoke in the ancient language of Sanskrit, neither language being widely spoken or even used in the area. Azariah was able to speak to the people using words they understood, offering a message of hope, peace and truth that these other religions simply cannot offer. How amazing that the true message was the only message to be understood by the crowd! A wonderful opportunity to show the Indian people that our God is near to us, and able to be approached; He is not a god who is foreign and does not speak our language. After the service many of the people came up to Azariah to thank him for his message and to be prayed for. December, 2009- Azariah Korabandi, Field Director for Pillar Missions in India, was recently named as one of the three recipients for the Rajiv Gandhi Manav Seva Award. Awarded by the State of India, this nationaly recognized award is presented each year to three individuals who have made an outstanding contribution towards service to children in the fields of child development, protection and welfare. The award, named after the late former Prime Minister Rajiv Gandhi (1984-1989) was presented to the recipients last month in New Delhi. The Happy Home: provides care and housing for children with HIV. The Children’s Homes in Nandigama and Gollapudi:provide housing and care for orphans and poor children whose families live in locations where education is not readily available. 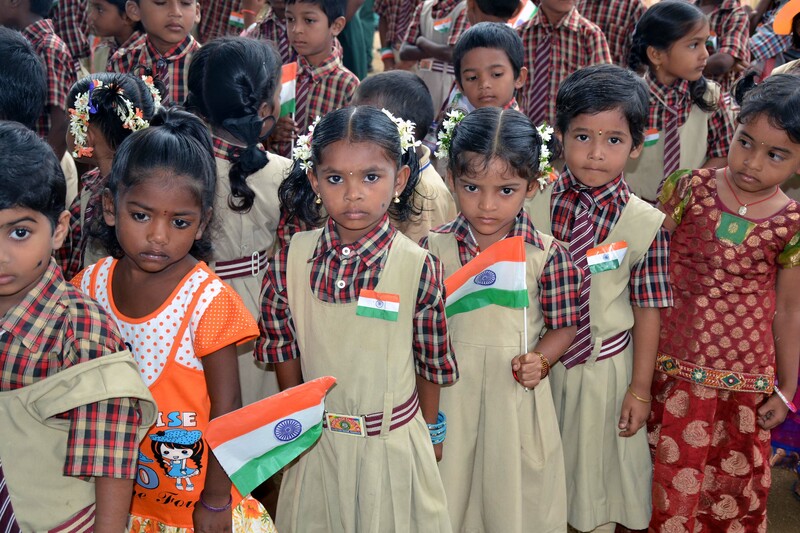 Shanti School in Khammam: provides free education from K through 10th grade for the children of the poor local Hindu community. School for Mentally and Physically Handicapped Children in Khammam: Each day the children are picked up by the ministry and taken to the facility, where infants all the way up to teenagers are given the opportunity to grow, learn and hear about Christ. Health Clinics: Through the Rotary’s Artificial Limb Center and through St. Mary’s Hospital in Khammam, as well as local village health clinics, children are ministered to and provided with medical care. Kings Kids: network of evening programs throughout the more populated areas, where hundreds of children gather once a week to sing and hear about the gospel. There are also smaller ministries under Azariah’s oversight where children come for breakfast before school and for their evening meals. Entire families, including children, are also provided for within leprosy colonies. Opportunities for reaching the lost, hurting and needy people with the love of Christ abound, and Azariah has given his life to ministering to the needs of others. His work in India is truly a labor of love for the country’s people, and we at Pillar Missions rejoice that the Government of India has taken notice of the work being done by this humble servant of God.